BOOK A PIECE OF PARADISE FOR YOUR 2019 SUMMER VACATION! INTERNET AND WiFi available to our guests. CLEANING FEE WAIVED FOR EXTENDED STAYS OF 14 DAYS OR LONGER. PLAN YOUR SPRING, SUMMER, FALL & WINTER VACATIONS NOW BY SECURING THIS BEAUTIFUL UPDATED CONDO. L-203 - Come and discover all that Paradise has to offer while staying in this beautiful partial ocean view, 1 bedroom, 2 bath, fully AIR CONDITIONED condo. Enjoy all the amenities of a hotel, but at much lower rates. Not sure of what to do, the Activity Desk in the lobby can help plan your day. Need a ride to the beach? The Concierge will arrange a golf cart shuttle, although the # 1 beach (Kaanapali) on the island is just a stroll a way along the path of the lush greens of the North Kaanapali Golf Course. Snorkel at Black Rock or swim in 1 of 3 sparkling pools the Maui El Dorado has to offer. For those last minute provisionals, visit the El Dorado market. Enjoy the Maui scenery by taking a breathtaking drive to Hana, and when you return from your days journey open up your sliding glass doors from either the living room or bedroom and relax/bbq on your private lanai decorated with beautiful teak furniture and experience the spectacular Maui sunsets, which will keep you coming back to this beautiful condo and island. Shopping, dining and entertainment can be found at Whaler Village, which is a short 5-10 min walk. The town of Lahaina for lots of tourist fun is just a 10 min drive. We offer competitive rates and discounts for our returning guests. Pets and smoking are NOT allowed in unit. The Maui Eldorado charges a $60 Check-in fee and a $17 daily resort fee (includes parking). 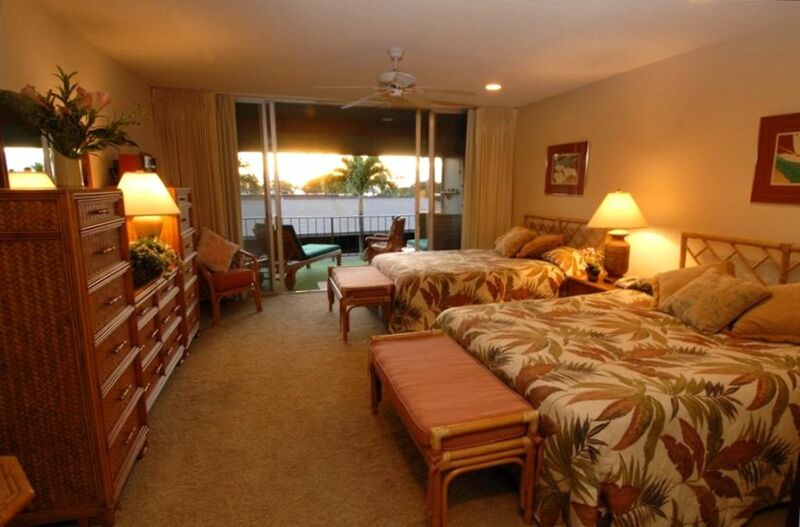 Both are due at the time of check in and are made payable directly to the Maui Eldorado. Stereo with iPod docking station. This is the Perfect location. You don't really need a vehicle to enjoy your stay! Fit our family needs perfectly! Fabulous location with a beautiful, quiet beach within walking distance; well-stocked / equipped property; very spacious unit that was perfect for our family of four! Anka was very accommodating with a late departure on our last day. Would not hesitate to stay here again! Best location, very responsive owners. Will definitely go back! Best thing about L-203 is the location, location location! It sits just shy off the 4th hole on the Kaanapali Golf course. You get spectacular sunset ocean views. Since it sits on the right side of Black Rock, it really allows you get to away from all the big named hotel crowds and noise. At the Eldorado it’s so quiet, you truly feel like your on vacation. It’s a 5 minute walk down to the “Beach Walk” which takes you past all the big named hotels into Whaler’s Village where there’s shopping and dining, or you can do the 10 minute drive to Lahaina. There’s also a General Store in the little shopping center in front of the hotel if you need last minute essentials. The Island Press Coffee is a great local coffee shop too. The condo was perfect for our family of 4. We have teenage daughters, so having TWO spacious bathrooms were key. The bedroom size was spacious too. With two queen beds, it never felt small. We always had more then plenty of room. Having a small kitchen space was great, we did breakfast every morning and some nights we made dinner. We used the gas grill just outside of our unit instead of the one in the condo, just because the gas grill was larger. The lanai is HUGE! I don’t think we ever ate inside, we were always out on the lanai. The newly renovated pool is just a few steps away. Down at the Cabana, you can rent out beach chairs and towels for the day if need be. Anka was always quick to respond with any questions we asked. She even worked with us getting a very late checkout since our flight wasn’t until 8:45pm. My family and I couldn’t stop saying how great this condo is. We’ll definitely stay here again when we come back to Maui! Thanks again Anka!!! Thank you for your review. It means to so much knowing that you and your family enjoyed your stay. Know that our home away from home in paradise is your home away from home in paradise. Looking forward to your return, sooner rather than later! This is probably the only place I will ever want to stay when on Maui! We are so glad you had a great time staying in our condo. You are welcome to stay anytime!!! Great location with a view of the Beautiful Sunsets and the Ocean too! The kitchen is well stocked with everything you need and easy to get around with a nice walk to the beach, other hotels and Whalers Village for shopping and dining. Perfect for families. We had a wonderful time and look forward to coming back to Maui again. A fantastic spot. The Kaanapali Outrigger Eldorado is always a great spot, and these folks ensure that the accommodation for a vacation will be seamless. We will certainly be returning in future years. Thanks!